Floor to Top of Seat: 43"
Maximum Recommended Height: 5' 9"
Minimum Recommended Height: 5' 10"
Minimum Recommended Height: 5' 5"
If you're unsure as to which type of lift chair is best for your situation, consult the following guide to learn more about the options available to you when you shop. 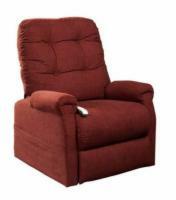 Two Position Lift Chairs - A two-position lift chair is designed to allow you to sit comfortably at a slight recline for reading during use, and also assists you in sitting and standing when getting in and out of the recliner. 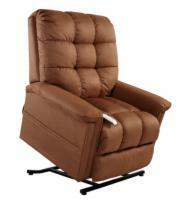 Two-position lift chairs tend to be the most affordable types and are best for casual users who simply need help standing and sitting, but may not otherwise use their recliner for long periods of time. 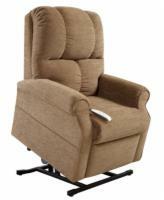 Three Position Lift Chairs - A three-position lift chair features the same slight recline for reading and relaxing as a two-position model, but also includes a steeper recline for napping. Three-position lift chairs offer more versatility to most users, and often allow for more additional features than simple two-position models do. 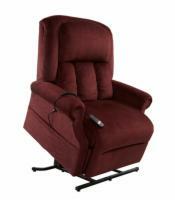 Infinite-Position Lift Chairs - An infinite-position lift chair allows for a full flat recline position for sleeping. These lift chairs have dual motors that can operate the footrest and backrest independently of one another, allowing you to create a wide number of positions in order to find the setup that's most comfortable for you. AmeriGlide's popularity as the top-selling stair lift brand in the United States goes back to the simplest of our core principles: accessibility and affordability aren't exclusive. We strive to offer the highest quality product at the lowest possible price point, every time we make a sale, with customer support and warranty coverage to match (or even exceed) other industry leaders. Our line of lift chairs follows the same principle. While there are many fine lift chair manufacturers in today's market, true quality and craftsmanship remain out of reach for many buyers. It's our belief that our products can rival the quality of many lift chairs that are significantly more expensive without sacrificing the engineering and design principles that ensure your AmeriGlide lift chair will bring you years of service with minimal maintenance or worry. To learn more about AmeriGlide's low-price, high-quality selection of lift chairs, explore our product listings above, or contact a representative now.